The UK Drinking Guidelines – what is risk? Today we return to trying to understand the rationale for the new drinking guidelines introduced at the end of 2015. The key concept is ‘risk’. This word is used 13 times, appropriately enough, in the summary version of the guidelines that I reproduced in July. When first mentioned, the context is ‘keeping risks to a low level’, while thereafter it is mostly about ‘increasing risk’ due to drinking; there is also ‘avoiding risky places and activities’ when drinking. The last caution is about indirect effects and is not discussed further in this blog. The first two effects are quite separate concepts. In technical terms, keeping risks to a low level is about absolute risk, whereas increasing risk is about relative risk. The difference is important! Drinking increases the risk of certain illnesses and causes of death, but if the absolute risk of each of these remains low, does it really matter? The same distinction arises for all sorts of pastimes. For example, hang-gliding is rated as one of the most dangerous hobbies. The risk of injury of death from hang-gliding varies from flight to flight, according to your training, experience, location and the weather. Good judgment and practices reduces the risk and vice versa (just like drinking). The relative risk presumably varies quite a lot from flight to flight and person to person. But overall, the absolute risk is about one accident every 30,000 flights, of which a quarter are fatal. I will refrain from offering an opinion as to whether this is ‘high’ or ‘low’. Use of these terms is the subject for another blog. Hang-gliding enthusiasts clearly consider it acceptable and, unless you are one or are in some way attached to one, your opinion doesn’t really matter. It is, however, enough for insurance companies to take a dim view of the hobby (or, more likely, a profitable view). We need to make a further distinction, between illness and death. Medics and statisticians use the terms morbidity and mortality. So now we have four numbers to think about: the relative and absolute risk of morbidity and the relative and absolute risk of mortality, each broken down by type of cancer, liver condition etc. And it doesn’t quite stop there. Every time you read a report that ‘such and such increases your risk of dying by x%’, remember that the risk of dying is always 100%! So is it sensible to talk about the effect of alcohol on mortality in terms of risk? Yes and no: yes if the event at risk is defined as ‘dying younger, due to alcohol’, no if it’s just ill-defined death rates that are being quoted. 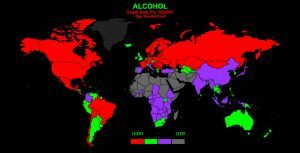 We will look at the numbers in some detail in further blogs but for now I will give the risk of alcohol-related mortality. The number of deaths in the UK in 2014 attributable to alcohol intake was 8,697. That’s out of a total number of deaths of 570,341. So 1.5% of all deaths were alcohol related. This is the overall, long term, absolute risk. Again, whether this is ‘high’ or ‘low’ depends on where you sit. But we are not exactly a nation drinking ourselves to death, even under the previous guidelines. Some other countries qualify better for that dubious distinction. 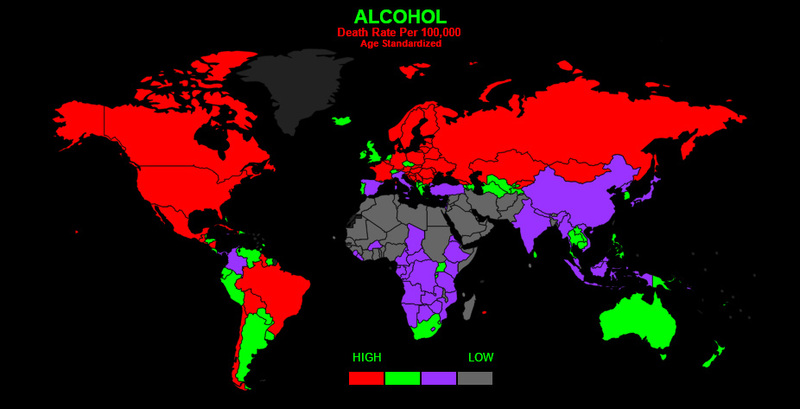 Look at the world map here, which is from http://www.worldlifeexpectancy.com/cause-of-death/alcohol/by-country/. The UK is coloured green, not high but above average. We rank 59th, based on deaths per 100,000 population, a different though related measure to the percentage of deaths. The ignoble crown goes to Estonia, followed by Lithuania, Belarus, Russia, Ukraine and then, surprisingly, Denmark. (Vodka is a common theme… but don’t jump to conclusions about cause and effect; we will discuss this some other time.) Let’s just note for now that Estonia has 22 (alcohol-related) deaths per year per 100,000, while the UK has 1.7. As the population of Estonia is just 1.3 million this rate implies about 300 deaths from alcohol per year. So even Estonia is not exactly drinking itself into oblivion.